The 1961 Fleer baseball card set is one that cost conscious collectors love. The set is filled with legends of the past like Babe Ruth, Walter Johnson and Ty Cobb but, since the set was manufactured after their playing days, the cards are much more affordable. The set also includes a final card for Ted Williams, who appeared in the 1960 Fleer baseball set as well. In the following article, we dig deeper into a set that is appealing in more ways than one. The 1938 Goudey baseball card set has long been a collector favorite as a result of its unique design and excellent player selection. Despite only containing 48 total cards, the set remains one of the toughest to complete in high-grade from the period. Anchored by two Joe DiMaggio cards and many Hall of Famers throughout, including those of Jimmie Foxx, Bob Feller and Hank Greenberg, the condition-sensitive cards provide a challenge for the advanced collector. This 14-card set may be small but, it is packed with some of the finest names in the sport of basketball. No, they are not the Lakers but, the 4-time winner of division titles, winners of 8 conference titles and 2 championship titles, the New York Knicks are definitely worthy contenders. The All-Time Knicks set contains rookie cards of Bill Bradley, Willis Reed, Walt Frazier, just to name-drop a few. The majority of the cards in this set are "Top Pop" cards, the few that aren't have only 1 example graded higher. Click here for a glimpse. 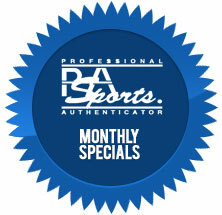 All Years - All Sports & Non-Sports - $20 Per Card/No Minimum – 5 Business Days (approx.) Click here for details. Sports fans, have you ever wondered what it would be like to meet the legends of the games you love? Come out to Rich Altman's Boston Sports show at the Shriner's Auditorium and find out! From April 12 - 14, 2013, fans have the rare opportunity to meet some of sports greatest athletes. This auction consists of 500 lots with cards and memorabilia from 1882 to present, and includes graded and raw cards, commons and Hall of Famers. Featured cards include: N172 Old Judge Hank O'Day plus seven other N172s. E106s of Honus Wagner and Nap Lajoie. 1926 Lambert & Butler Bobby Jones *Rookie* PSA 7, over 80 T206s with many tough backs. You'll also find 1933 Worch Cigar Rogers Hornsby 6, 1953 Dormand Mickey Mantle 8.5, and 1966 Yaz 9, with none graded higher. There are 956 lots for auction that will end on Thursday March 7, 2013 at 11 PM EST using the 15 minute rule. This auction features many high grade and low pop cards for collectors to complete their sets from the 1950's through the 1970's. PSA Authorized Dealer Steve Novella is breaking a high grade PSA-graded 1955 Bowman Football Set card by card on eBay. Cards end Tuesday, March 5. Set includes several PSA 9's including a Pat Summerall RC; five PSA 8.5's; 75+ PSA 8's including Jim Ringo and Bob St. Clair RC's; and 50 PSA 7's. Feb. 23 auction sees 1949 Mickey Mantle signed and endorsed Yankees signing bonus check bring $286,800; 1969-71 Lew Alcindor game worn Milwaukee Bucks jersey, worn during the Bucks only championship, realizes $95,600. 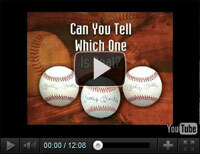 By the end of 2013, which of the following baseball autographs do you think will be worth the most?